SHANKHNAD.ORG: Did an Indian fly first unmanned aircraft? Shivkar Bāpuji Talpade (1864–1916) and Subbarāya Shāstry were two Indian scientists, who have constructed and flown modern world’s first unmanned airplane in the year 1895 to a height of 1500 feet.Wright brothers did it in the year 1903 (8 years later) and got recognized as the inventors of modern day Aeroplane. Shivkar flew an unmanned flying machine which was an mercury ion plasma , imploding and expanding vortex noiseless flying machine, which could move in all directions*(citation needed).Accelerated pressurized Mercury when spun and thus heated gives out latent energy.Infact mercury was the fuel of many ancent vimanas*(citation needed), including the one described in ‘Samarangana Sutradhara‘, which was written by Paramara King, Raja Bhoja during 1050 AD. Shivkar’s feat was witnessed by more than three thousand people including Britishers at Chowpatty beach in 1895. (Unfortunately, Indian science was not given prominence by the british, so few inventions like this and Jagadish Chandra Bose, who demonstrated publicly the use of radio waves in Calcutta in 1894, but he was not interested in patenting his work. )He was threatened by britishers for flying an unmanned plane in public. 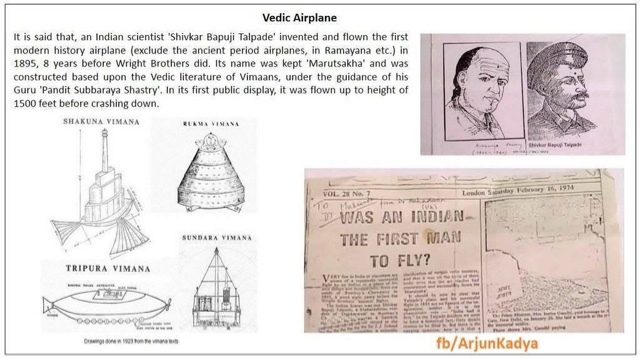 Rukma vimana maruthsakhaTalpade’s airplane was named Marutsakhā, a term used for the goddess Sarasvati in the Rigveda (RV 7.96.2) – a portmanteau of Marut meaning stream of air and Sakha meaning friend.This was built under the guidance of Pandit Subbarāya Shāstry.It was airborne for 18 minutes and after that the Naksha Rasa accumulators ran out of energy*(citation needed). Bal Gangadhara Tilak the editor of Kesari Pune had put in an editorial . It was also reported by two other English newspapers, a terse account. Eminent Indian judge Mahadeva Govin-da Ranade and King of Baroda H H Sayaji Rao Gaekwad witessed the flight. Shivakar’s wife was very technie savvy and was his partner on the day the flight of MARUTSAKHA took place.One of Talpade’s students, Pt. S. D. Satawlekar, wrote that Marutsakhā sustained flight for a few minutes. Deccan Herald in 2003 stated “scholarly audience headed by a famous Indian judge and a nationalist, Mahadeva Govin-da Ranade and H H Sayaji Rao Gaekwad, respectively, had the good fortune to see the unmanned aircraft named as ‘Marutsakha’ take off, fly to a height of 1500 feet and then fall down to earth“. Few days after this first flight, Talpade’s wife, who was his partner in this experiment, died mysteriously !After her death, Talpade went into depression, ran out of finances and ultimatelt died in 1916.However, Marutsakhā was stored at Talpade’s house until well after his death. Velakara quotes one of Talpade’s nieces, Roshan Talpade, as saying the family used to sit in the aircraft’s frame and imagine they were flying. A model reconstruction of Marutsakhā was exhibited at an exhibition on aviation at Vile Parle, and Hindustan Aeronautics Limited has preserved documents relating to the experiment. Hawaaizaada is a 2015 Hindi film directed by Vibhu Puri. The film stars Ayushmann Khurrana, Mithun Chakraborty and Pallavi Sharda in pivotal roles. The film is based on the life of scientist Shivkar Bapuji Talpade.